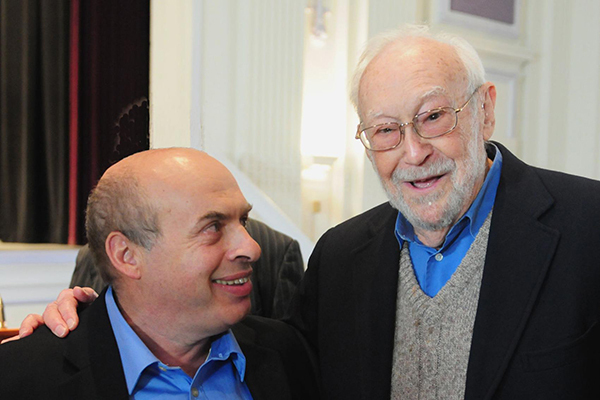 Louis “Lou” Rosenblum, right, a pioneer in the Soviet Jewry Movement, with Natan Sharansky in 2010. The pair met around 1974 during Rosenblum’s visit to the Soviet Union. We are saddened to share the loss of Louis Rosenblum z"l, a leader in the creation of the Cleveland Council on Soviet Anti-Semitism and the national Soviet Jewry movement. Lou's legacy is a reminder of what we can do when united and what one heroic man can achieve for the Jewish people. Our thoughts are with the entire Rosenblum family during this difficult time. Baruch Dayan Emet - May Lou's memory be for a blessing. At Beth Israel, Rosenblum was part of a small group of men that formed a social action committee that would later become the Cleveland Council for Soviet Jews. Among its major accomplishments was its lobbying in Washington, D.C., which led to the Jackson-Vanik amendment to the Trade Act of 1974. The amendment was intended to affect U.S. trade relations with countries with non-market economies that restrict freedom of emigration and other human rights. In the early days of the action committee, formed around 1961, the Holocaust was a prominent figure in its studies and deliberations. What struck the group was the lack of response of the dire predicament of European Jews from the U.S. government and American Jewish leadership. In 1963, it led them to question if a major Jewish population was at risk. What they found was the plight of 3 million Jews in the Soviet Union. 17 prominent Cleveland rabbis, the news of Soviet Jews was garnering attention and caused Rosenblum to take a leading role in the committee. In a rebranding initiative to give the group more credibility on a national level, the committee enlisted well-known Jews and changed its name to the Cleveland Council on Soviet Anti-Semitism. While he was leading the grass roots movement, Rosenblum was also working at the then-NASA Lewis Research Center (now known as the NASA John H. Glenn Research Center), where he would come to direct the solar and electrochemistry division, Miriam Rosenblum said. Louis Rosenblum moved to Wellesley Hills, Mass., about six years ago. When he would need to travel for work, Miriam Rosenblum said he would schedule his trips to fall close to the weekends so he could take advantage of the free time to speak with other’s around the nation about Soviet Jewry. This would set the foundation for the 32 chapters that formed the Union of Council for Soviet Jews and continued the movement. Throughout the two decades Louis Rosenblum actively worked in the movement, he started a mailing campaign with a partnership through American Greetings and the Jewish Federation of Cleveland. A package of five holiday cards were given to American Jews along with a list of Soviet Jews for the cards to be sent to, which humanized the cause. He also found out that Soviet Jews were taking Hebrew classes. Those Hebrew teachers would be arrested in the Soviet Union for not having a teaching license. Rosenblum partnered with the late Henry Margolis, a Jewish educator, to offer licensing to those teachers. Rosenblum was the father of Jan, Miriam (Sheldon Benjamin), Diane (Henry Gordon) and Daniel (Sharon Waxman). He had eight grandchildren and three great-grandchildren. He was predeceased by Evy, his wife of 64 years, and his brother, Myron.